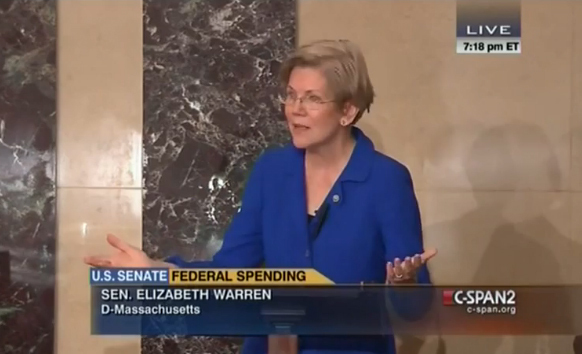 Progressive Senators Elizabeth Warren and Bernie Sanders have been calling for the feds to bust up the banks. In a fiery speech last December, Massachusetts Senator Elizabeth Warren said when CitiGroup can sneak deregulation into a must-pass governmental budget, it has too much power and should be broken up. JP Morgan Chase CEO Jamie Dimon thinks Massachusetts Senator Elizabeth Warren doesn’t “understand global banking system”. So, Dimon and Warren don’t have a basic disagreement on how banks should be managed and regulated. Now we know that Liz is just stupid. Obviously, if she fully understood what Dimon and his band of thieves were doing, she wouldn’t be fighting them so hard. Ironically, in recent weeks, President Obama also called Warren’s opinions on the Trans-Pacific Partnership (TPP) ignorant. In March, Berkshire Hathoway CEO Warren Buffet she is too “angry” and “violent” in her critiques of Wall Street. It pisses me off as a woman, as a progressive, and as a banking reform advocate that Dimon, Obama, and Buffet resorted to personal smears rather than honestly debating Wall Street’s gambling operation and actually doing something about it– like busting up the too-big-to-fail banks or (better yet) taking control of the US money supply out of the hands of privately owned banks. Warren didn’t take Dimon’s insult lying down. Think Progress reported the Dimon and Buffet comments and offered some great background information regarding why Warren is not Dimon’s favorite Senator. They also reported that the banksters threatened to withhold campaign donations to Senate Democrats to protest Warren’s outspokenness. JP Morgan Chase said that donations hinge on a friendlier atmosphere. Warren’s résumé comes with nearly 20 years of experience teaching corporate law at Harvard University, publishing nine books, chairing the Congressional Oversight Panel that oversaw the bank bailouts in 2008 (of which JP Morgan was a beneficiary), and coming up with the idea for and helping to create the Consumer Financial Protection Bureau, which has already helped consumers avoid numerous predatory lending schemes and recouped more than $4.8 billionthrough its enforcement actions. She has also become widely known for her tough critiques of the banking industry. She has questioned why the government didn’t break up the biggest banks, like JP Morgan, when it offered bailout money in 2008 and joined a group of Senators in 2013 to propose reinstating a Depression-era rule that separated commercial and investment banking. She’s been a staunch supporter of the 2010 Dodd-Frank financial reform bill and stood in opposition to Republicans’ attempts to roll parts of it back. She’s long criticized regulators’ reluctance to go after the biggest banks for their misconduct. Shequestioned the Securities and Exchange Commission, Justice Department, and Federal Reserve on the lack of prosecutions for banks’ misdeeds that led up to the financial crisis, saying, “If large financial institutions can break the law and accumulate millions in profits and, if they get caught, settle by paying out of those profits, they do not have much incentive to follow the law.” Sheproposed a bill that would have made settlements between banks and these regulators more transparent in an effort to tamp down on the government’s exaggerations. Just last week, shesent a letter to the SEC chairman voicing her disappointment in the agency’s failure to enforce existing rules governing the financial industry and its slow pace in writing new rules as mandated by Dodd-Frank. And she’s also stuck it to JP Morgan itself. In 2013, the bank announced that one of its traders in London, who came to be known as the “London Whale,” had made a series of bad bets that ended up costing the bank $6 billion. The bank was eventually made to pay $900 million in fines and “admit its traders acted recklessly” when it was found the trades violated rules against banks making such bets with their own capital and against market manipulation. Go, get ’em, Liz! We’re behind you. Bring back the Greenback!